In 2017, Bristol Avon Rivers Trust (BART) applied to the Environment Agency’s ‘Fisheries Improvement Fund’ following a walkover survey of the entire length of the river and several small improvement projects over recent years. restrictions by weirs, as well as the historic straightening of large sections of river. The objective of this project was to contribute to addressing some the main issues affecting the river. BART identified three weirs; Moses Weir, Stanley Weir and an unnamed bedrock weir where fish passage and, if feasible, upstream riverine habitat improvements following the weir removals, would gain significant benefits for the river. Hydro-Morph Ltd was commissioned by BART to undertake an initial site visit and pre-feasibility investigation of possible options for improving fish passage and upstream habitat at each structure. These reports have been completed and provided to the Environment Agency Fisheries and Biodiversity team. constructed from bankside materials to help re-meander the river within it’s straightened banks. within 2-3 years. We will continue to monitor the progress of these structures as this occurs. Figure 1. 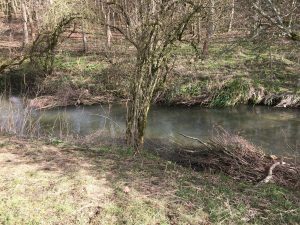 A ‘pinch point’ created with a wooden berm which will encourage flows to scour the gravels, flushing out silt and improving fish spawning potential. Figure 2. Alternate berms constructed to re-form a meander within the banks of this straightened section. conditions for a year before reassessing whether there is a need for any follow up habitat work. Figure 3. Before and after – removal of one of the boulder weirs. Thanks to all of our fantastic volunteers for their help with this project, to the landowner, land agent and tenant farmer for their help and enthusiasm and of course to the Environment Agency for funding these works. 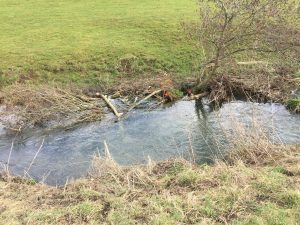 A huge thank you also to Wroughton Angling Club and Calne Angling Club, without whom this project would not be possible. We are looking forward to continuing to improve the Marden!